The Highlands at Dove Mountain in Marana, Arizona is nestled in the foothills of the Tortolita Mountains 25 miles northwest of Tucson. It is an intimate gated community favored by homebuyers who want all the benefits of a full-scale active adult community, without the crowds. 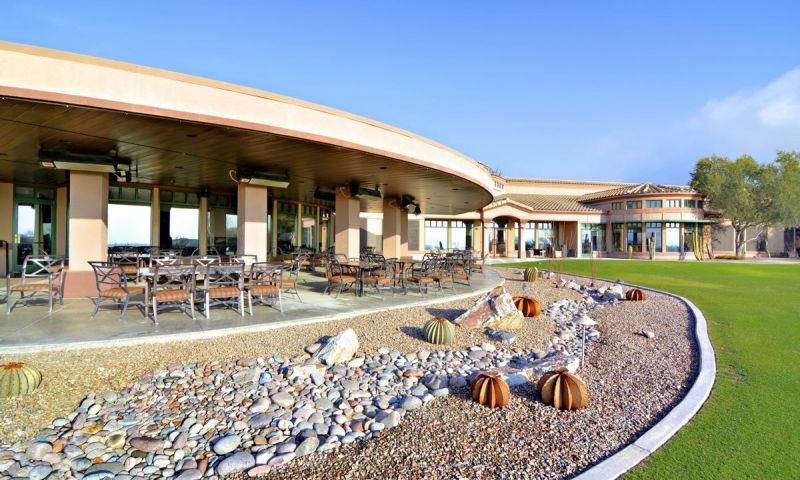 Active adult residents of The Highlands at Dove Mountain enjoy private amenities and dozens of clubs. Residents of The Highlands in Marana enjoy their low-maintenace homes and vibrant lifestyle among friends and neighbors who share the same interests. Dove Mountain is home to the World Golf Championships-Accenture Match Play Championship. Every February the top 64 golfers in the world gather to compete on one of two new Jack Nicklaus Signature golf courses in The Ritz-Carlton Golf Club at Dove Mountain. In addition to the popular Jack Nicklaus courses, The Highlands at Dove Mountain Golf Course winds throughout the active adult enclave in Dove Mountain. The Arthur Hills designed course combines lush green landscaping complimented by the desert vista and views of the surrounding mountains. The Highlands at Dove Mountain was constructed between 1997 and 2007. It is comprised of 1,400 homes and is part of the 6,200-acre Dove Mountain master planned community. A majority of the community was built by US Home Corporation and a final phase by Lennar Homes. There is a wide selection of pre-owned single-family homes available for sale in the community. Homebuyers can select from homes that range in size from 1,100 to over 2,600 square feet. A delightful array of desirable features such as front porches, vaulted ceilings and finely tuned upgrades are available on many of the homes. Active adult residents of The Highlands at Dove Mountain can select a class, club, or activity to join that meets their unique interests. Continuing education is encouraged with Spanish classes, crafts are abound in the arts and crafts room, games are held almost daily, and events and trips are planned throughout the year. With exercise classes, dance groups, and water sports it's always easy to stay fit and healthy while living in The Highlands at Dove Mountain. The area surrounding The Highlands at Dove Mountain is somewhat rural but everyday shopping conveniences are readily available. The Dove Mountain Centre at the entrance to the community includes a grocery store, banks, Starbucks and other popular retail outlets. Dove Mountain was masterfully designed with an emphasis on low-density. Almost a third of the development's nearly 9 square miles is dedicated to open space. Additionally, the integrity of Dove Mountain's perimeter is forever enhanced with over 10 miles of boundary protected by preserved land. At an elevation of 3,000 feet, residents enjoy summer temperatures that are an average of seven degrees cooler than Phoenix. The milder summers make outdoor activity enjoyable 12 months out of the year. The Highlands at Dove Mountain in Marana and the surrounding area is ideal for outdoor enthusiasts. There are miles of hiking and biking trails that meander through the community. The adjacent Tortolita Mountain Park provides over 3,000 acres of undisturbed land that is great for camping and horse back riding. State-of-the-Art Fitness Center - 5,500 Sq. Ft. There are plenty of activities available in The Highlands at Dove Mountain. Here is a sample of some of the clubs, activities and classes offered here. Active adult homebuyers can select a resale home that fits their unique needs. The Highlands at Dove Mountain contains single-family homes that offer between 1,111 and 2,461 square feet of living spaces. Homes here have two to four bedrooms, two bathrooms, and an attached garage. This is a beautiful community. Wonder sun rises and set with a 360 degree view of mountains. Very playable golf course. Tennis courts are slower, but so are most of us here. The restaurant has it's ups and downs, but it nice to have a place to eat here. Our home is large and comfortable. Love the landscaping throughput the community. We fell in love at first sight. I have lived at the Highlands since 2012, and I love it here. The community is constantly improving and upgrading the amenities for us. Our club house resturant has delicious food, and if I want take out I just pop in my golf cart and head to the clubhouse to pick up a pizza. We just added a short game area for residents to practice chipping and bunker play. Since I moved here I've learned how to work in clay, photography, line dancing, Pickleball and Bocce ball. The Highlands is a close-knit community,that shares and gives to all. The Tortolita Mountains have panoramic views and amazingly beautiful sunsets. A premium Outlet Mall just opened five minutes from here, and Tucson is 20 minutes. There is terrific theater downtown and awesome art everywhere including the overpasses on the highway. I feel like I live in a resort. We visited many retirement communities in Arizona and could not be happier that we chose the Highlands at Dove Mountain. The area is beautiful and we appreciate the lush green of the golf course and we don't even golf. It is easy to see that the community is well maintained and being a gated community adds an extra sense of security which many other communities lack. Before buying here we thoroughly investigated the HOA and found that it is financially sound. In just 2 years of living here we have made so many good friends and found loads of activities and classes to participate in. And what a great location. Being close to I-10 easily gets us to downtown Tucson or to Phoenix whenever we want. We can't say enough about how great it is to live here. Come see for yourself. We could not have selected a better place to move than The Highlands at Dove Mountain. We selected this community because of its surrounding beauty. We didn't realize there would be unexpected benefits like the hundreds of birds who like it here, too, or the stunning sunsets. We've enjoy our home, our neighbors, and the environment for over 10 years. People here are friendly and always ready to lend a helping hand. Staff, most of whom have been here many years, provide unlimited activities ranging from world class performances to wine dinners and from trips to other AZ towns to tours of Tucson landmarks. We have a beautiful golf course, challenging but not impossible, a large pool, pickle ball and tennis courts. Having been involved in financial management, we know that The Highlands' financial position is very strong and the envy of other communities, thanks to good governance. I can't imagine living anywhere else. We love this community! It is smaller than many of the others in the area that we looked at and it is gated which is a real plus because we are only here 6 months. We love to hike and the trails in the Tortolita Mountains are just minutes from our house. Dove Mountain is a beautiful area. We chose this community because of it is well managed and super close to I-10. The views are great, we don't golf but hope to learn soon. You need to see it for yourself. There are a lot of problems in this community. Unfortunately, the HOA Board of Directors is not transparent about decisions and does not communicate well with homeowners. Homeowners who bring concerns to the Board that most Board members do not agree with are simply dismissed. The HOA Board does not use science from desert experts to care for our common areas. The common areas are over manicured, trees are cut down for no reason, and qualified desert landscapers are not involved. Like so many of those in positions of power, the Board at the Highlands does not listen to the facts but rather makes many decisions simply because of what the members think. Our community just spent a lot of money to redecorate our Clubhouse lobby with very cheap looking furniture and accessories. It is embarrassing. The Board and Manager waste a lot of money on nonsense. Our HOA dues are in the process of being increased for 2015 as a result. Some the previous favorable reviews are by Board Members and their friends - notice names are not even given. They are not the true picture of this community. We have owned a home in The Highlands for 8 years. It is a lovely community filled with active and friendly residents. The homes are well built and set in lovely surroundings on a well maintained golf course. Due to very talented and sincere people who give their time to serve on committees, the development is fiscally sound and very attractive. Property values are enhanced by spectacular views from many homesites. These views and the common areas are maintained according to a set of written standards that are approved and monitored by the HOA. We have been able to make good friends, the facilities and amenities are great and the staff is helpful. I have been looking for a place to call home in southern Arizona and recently came across this gem. After reading the reviews about the views I asked my ambassador (yes they assign a person to you, which is great! )about the comment. Yes there has been some view management trimming and removal done. I have played the golf course and viewed the homes and I can't believe the beautiful views and landscape. I am in the process of putting an offer on a home in this intimate beautiful community. We bought our home late last year and have found the Highlands to be even more than they say about the property and amenities. The golf course has unsurpassed views and keep in excellent condition, the amenities are great from a large pool area with shade in many places, to a fabulous fitness center, restaurant and more programs than one person could ever find time to attend. And, the best part, the community HOA is only $170 month. This community is only 1290 or so homes. Small enough to easily get around, space galore and it is the only one we found that had all the amenities, nearest to I-10 and the facilities are excellent. I am so sorry the person below found so many problems at the Highlands but we have found none of this. We have many, many snow birds renters here year after year. My neighbors have rented for over 14 years here. That statement alone says this is a community you can happily call home for many years. During a recent visit, we were almost hit in the crosswalk by a golf cart! The driver then yelled at us for being in his way. Also noticed golf cart drivers run the stop signs here. I do not feel that this would be a safe place for our grandchildren to visit. We will keep looking! This community has been a terrific choice....smaller and intimate. We love being able to jump on I-10 in minutes and be downtown. Dove mountain is very beautiful and we go hiking in the tortolitas right here. Overall the golf and amenities were what we wanted, it seems like a younger group here and we were most surprised by the strong financial position of the HOA. My wife and I moved to Heritage Highlands last summer after searching for a community to enjoy retirement that wasn't too big. We came across Heritage Highlands through a friend-of-a-friend who recommended it and we couldn't be happier. I didn't want to move to a really big community but my wife wanted all the fancy amenities so this made us both happy. There are lots of nice amenities here plus we have access to everything at Dove Mountain too. The golf is great and the mountain views are spectacular. We're involved in numerous clubs and have made lots of new friends here too. I would highly recommend it! 55places.com is not affiliated with the developer(s) or homeowners association of The Highlands at Dove Mountain. The information you submit is distributed to a 55places.com Partner Agent, who is a licensed real estate agent. The information regarding The Highlands at Dove Mountain has not been verified or approved by the developer or homeowners association. Please verify all information prior to purchasing. 55places.com is not responsible for any errors regarding the information displayed on this website.